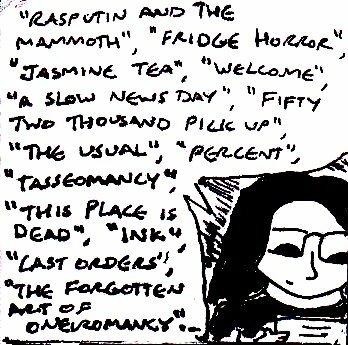 This entry was posted in "Liminal Rites - A Surreal Detective Novel, Writing and tagged chapter titles, how to, Liminal Rites. Have you ever read the Inkheart trilogy by Cornelia Funke? Not only does she use interesting chapter titles, but underneath those titles she also uses quotes from other books. I can’t remember if they fit in with the chapters but I know it made me pretty excited, like it added another layer to the story. I’ve done that with some of my fantasy stories, though I used quotes or writings from my own story, to kind of expand on the world itself that probably wouldn’t have made its way in. I haven’t read the Inkheart trilogy, but I’ve seen other writers do similar things before. I think that Terry Pratchett did something vaguely similar with the footnotes in his stories (although it’s been ages since I last read a Terry Pratchett book). But, yeah, I can easily see how using small quotes can be a brilliant way to hint at a much larger backstory and/or the world of the story. I wanted to do something like this list in spanish because there isnt any. Thank you for all the ideas, I loved the article! This was super helpful with my writing- thanks! Thanks for the article! It was super helpful and informative! I have been struggling with coming up with chapter titles for my novel so this article was perfect. How do I find further help with my chapter titles? Ah, I’m not really sure. There are probably other sites that discuss this topic further, although one of the best ways to learn is just to look at how other writers come up with chapter titles and how TV show writers come up with episode titles.